On the journey to legendary Sapa, it is regrettable not to come to the beautiful Muong Hoa valley. Lying at the foot of Fansipan Mountain, Muong Hoa offers visitors great feeling. Muong Hoa valley is located in Hau Thao commune, 8 km southeast of Sa Pa town (Lao Cai). 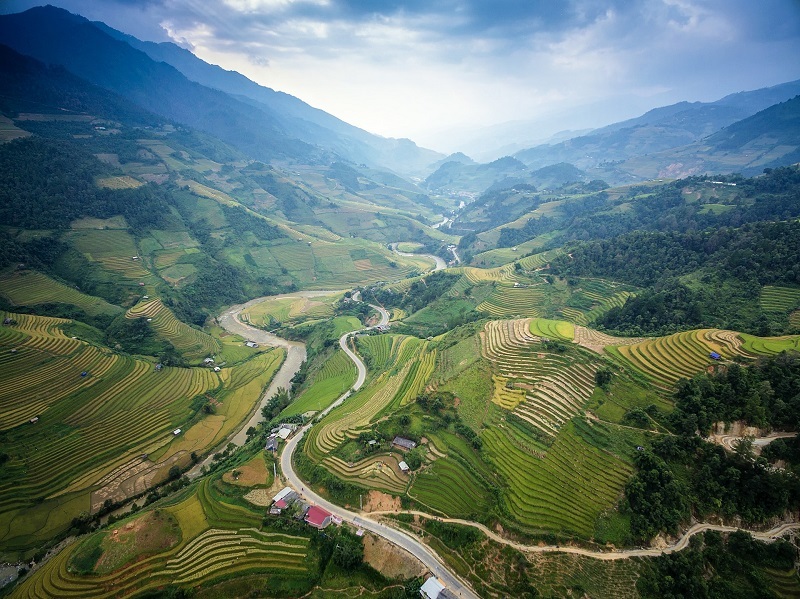 After passing a pass, come here, standing on the top of a mountain, overlooking the vastness, through a cloud of mountains, Muong Hoa valley appears before your eyes. A beautiful valley like a dream, beyond imagination and extremely beautiful. Perhaps watching Muong Hoa at high altitude to feel the beauty, lines, colors and vitality of this paradise. Muong Hoa valley stretches along the mountain, bending beautiful bow shapes. This land has been inhabited by Mong people for generations. The hands and the power of natural conquest of the people here have made the beauty of the valley is not equal. From the height of the view, the beautiful little houses are wandering on the side of the mountain, next to the fields, the winding roads along the mountains and running along the valley. This image creates a peaceful scene to the wild and fresh. Coming to Muong Hoa valley the most interesting is the "painting" terraced fields of the Mong people. It is a wonderful "feat" of the people here. Without the delicate, sophisticated lines of the fields, Muong Hoa will probably lose most of its beauty. 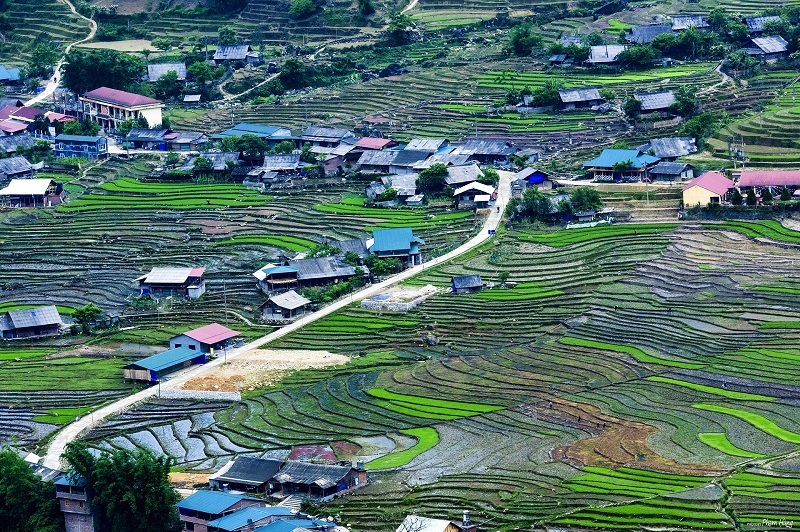 Which season to Muong Hoa, terraces also leave impressive in the hearts of tourists. In the water fall, Muong Hoa glittered under the lightly floating clouds. Sowing season, transplanting rice, Muong Hoa carries on his "green" shirt fat of the leaf. Rice season is ripe, the valley turns into a golden carpet at the bottom of the mountain. Come to Muong Hoa Valley in April, May, you will be surprised that in front of you is a giant mirror, all the terraced fields are in the water season, sparkling, dashing. Muong Hoa is also attractive to those who love exploring experience by pristine and natural beauty. If you step down to the village of this valley, visitors will discover the footprint of ancient people through the ancient stone blocks interwoven with forest canopy. The rocks with pictures, strange characters become a mystery to those who come to this land. Muong Hoa valley is more beautiful when it is adorned with white clouds bobbing in the afternoon, the sunlight glowing in the early morning and more romantic than the beams of Do Quyen forest flower in the season of blossoming make The whole valley is colorful. Especially when sitting on the cable car in the journey to conquer Fansipan peak to see the beautiful Muong Hoa. The whole valley of Muong Hoa is within your reach and shows the beautiful lines. From above, bent terraced fields, lovely houses, poetic feel in many angles, many lines and many looks. Although sitting on high but you still feel Muong Hoa is close, friendly just how much.